Thanks to such internet sites as mp3.com and CDBaby, which are supporting independent artists we have the opportunity to listen to music, we wouldn't as an average customer. The Smooth Jazz genre is dominated by one instrument: the saxophone. Personally I count several hundreds of sax players worldwide and therefore its important to present those artists which protrude from the average through their performance. One of these excellent artists is Jason Weber from San Diego/Los Angeles. 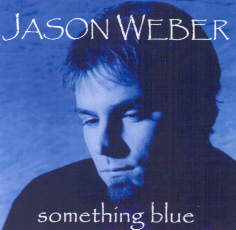 Weber has taken his talents to perform or record with national recording artists such as Arturo Sandoval, Nathan East, Gerald Albright, Everette Harp, Boney James, Dave Koz, Richard Elliott, Kirk Whalum, Marc Antoine, David Benoit, Steve Ferrone, Ray Fuller and Greg Phillinganes among others. As an unsigned artist he uses the possibilities of internet to present his music. His previous albums are "1st Avenue" (1997), "Leap Of Faith" and "Snow". His newest project is "Something Blue". The album starts with Reflections. A contemplative slow piece, on which Jason plays sax, keyboards and flute. Kurt Weber adds his muted trumpet. Jason plays warm and bright flute tones creating a laid back and peaceful atmosphere. J Street is a child of Hip Hop time with the typical drum machine groove. Mike de Rose plays nice guitar riffs. Jason delights us with tenor and baritone sax tones overdubbed by his flute. A funky drive. More up tempo music with Summer Solstice. One can remark Everette Harp's influence. A very energetic and rhythm emphatic tune. Back to thoughtful slow tunes with Alone In Paradise. Alto and tenor saxes are perfectly combined to dense soundscape. Be aware: all songs are written and arranged by Jason Weber. There is no cover on this album. The Road Less Traveled showcases Rodney Zinnen on drums, whose syncopated beats give the tune its dynamic flavor. Jason plays his soprano sax canonically. On So Cool Jason mellow soprano sax meets Mike de Rose's distortion guitar. Jason plays a fantastic soprano solo. Recognize his mastership. The title song Something Blue is dreamy and hooky. Although played in a slow manner Jason unveiled the beauty of his instrument in dwelling tones. Something Latin on Baile. Bossa rhythms and Spanish acoustic guitar are twinkled into Jason sax presentation. On Here & There But Nowhere we listen to typical funky incredients. Short sax blows, wah-wah guitar etc. Lost Love is another slow tune comparable in his structure with Alone In Paradise. Struttin' is featuring Patrick Yandall on guitar, a further great SJ artist from San Diego. A review about his newest album "Back To The Groove" is to find at www.smooth-jazz.de. Rainforest has it all. More than 5 minutes of power this piece never looses its energy. Based on a drum programmed rhythm Jason plays his mighty sax melodies. Got Funk? Who dares to answer with no? Indeed a funky finish. If you like Jason's music, check out his schedule. I suggest you to freqently visit Seaport Village, San Diego, USA. There Jason is playing with his band and with Patrick Yandall and in the meantime buy his album.